In 1984 Professor Bùi Quốc Châu proposed a new hypothesis and a new diagram; the brain on the face. The diagram was projected so that the frontal lobes were on the forehead and the cerebellum on the chin. Although it cannot always be verified that the right side of the body or face represents the right lobe of the brain and vise-versa. At first Pr. Châu did not find any precise correlations with the already known bqc·points but, little by little and with the help of clinical tests conducted by his students, the relationship between the points on the Dien Chan map and the Cranial nerves were defined. Then “Bridges” appeared between the known effect of every bqc·point and the function of the Cranial nerves. For example, Pr. Châu already used bqc·point 34· to treat ocular problems, as well as disorders located on the foot (the Penfield diagram) and the trapezium muscle (diagram of the extremities on the face). Initially he thought that the results were because point 34· is close to the eye, but thanks to his new diagram of the brain on the face, he verified that he had in fact discovered another reflection path: The Optic nerve. Not all ocular disorders are related to cranial nerve II, but it is very useful to check it, as it unblocks and stimulates the process of self regulation, obtaining surprisingly good results. Simply learning the bqc·points robs Dien Chan of its multireflexology dimension. So it shouldn't only be students of medicine who study the functions of the Cranial nerves, it is something that every therapist will benefit from. Also, using the multireflex tools to combine the precise stimulation of the fixed points with the zones of the diagrams offers a much better outcome. Point 197· nerve nº1 Olfactory —sense of smell. Point 34· nerve nº2 Optic –transmits visual information from the retina. 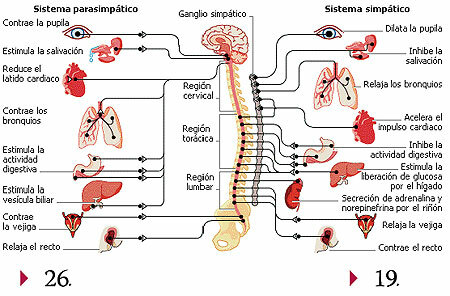 Point 184· nerve nº3 Oculomotor —innervates most eye muscles movement. Point 491· nerve nº4 Tochlear —innervates the superior oblique muscle of the eye. Point 61· nerve nº5 Trigeminal —sensations of the face and movement of the jaw. Point 45· nerve nº6 Abducens —innervates the lateral rectus muscle of the eye. Point 5· & 10· nerve nº7 Facial —controls the muscles of the face, secretion of saliva and tears and part of the tongue. Point 74· nerve nº8 Vestibulocochlear —auditory & balance. Point 64· nerve nº9 Glossopharyngeal —controls movement and sensation of the pharynx, part of the tongue and the secretion of saliva. Point 113· nerve nº10 Vagus —controls the movement of the veil of the palate, the heart, the veins of the larynx, lungs and alimentary canal. Points 511· & 156· nerve nº11 Accessory —controls the movement of the neck and shoulder muscles. Point 7· nerve nº12 Hypoglossal —controls the movements of the tongue. point 19· yang point —sympathetic nervous system. point 26· yin point —parasympathetic nervous system, pituitary gland. To stimulate the fixed points on the face it important to be able to detect and correctly identify the Dien Chan zones. If you are unsure about using the detector, stimulate the desired zone of the Cranial nerves diagram with the little hammer nº128, as it allows precise stimulation with the rubber tip, or a gentle stimulation with the prong side. On the second image the Detector nº101 is shown on the diagram of the points (also known as bqc·points), relative to the Cranial nerves. The first image shows the Yin-yang roller nº206 which is used to roll the reflex zones of the face. The spiked horn ball of the roller has a yang effect and is used to concentrate and stimulate the zone. The pronged roller is yin which refreshes, disperses and relaxes. Also on the first image is the little hammer nº128. With gentle tapping using the rubber end, which has a yang effect, the point is stimulated without the exact coordinates being needed. The prongs of the hammer are yin and, again with gentle tapping, disperses tension at the point. For a more lasting result on points or the most sensitive zones use the heat patch nº644. A small piece (0,5cm) is applied in the evening and can remain in place overnight. Salonpas™ slowly warms and stimulates (this patch contains methyl salicilat, read instructions and contraindications to see if it is suitable). 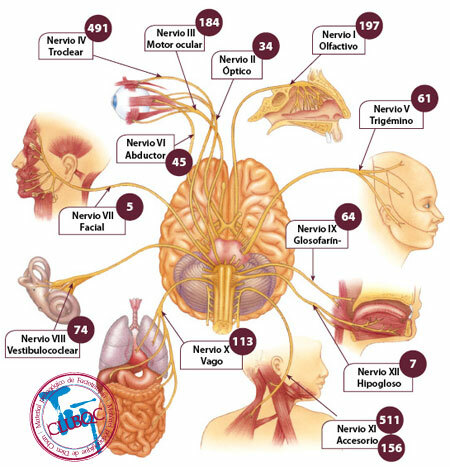 The diagram of the Cranial nerves, which can be found in the MiniBook of Dien Chan has a detailed list of the points, along with many other diagrams. Begin your studies with the International School of Multireflexology – Dien Chan (EiMDC). The complete course iBook with maps and insights to Dien Chan is available at www.DienShop.com. Dien Chan is the original facial reflexology method developed by Prf. Bùi Quốc Châu, in Vietnam; it is an easy and reliable identification technique. Thanks to it's immediate and sympathetic nature it is complimentary to other methods however, unlike Western or Eastern medicine, it does not make a diagnosis of a specific illness. Many therapists combine Dien Chan with other natural techniques as well as doctor prescribed medicines. Using their knowledge of the diagrams of projection they look for unbalanced organs, blockages, or other indications of stress to the body. For example: A client feels pain around the shoulder blade. The pain can be treated and relieved through the corresponding reflex zone, very quickly. In this particular case though, not being able to relieve the pain by more than 50% the Therapist, using the detector nº101 on the nose (the reflex point of the spine on the diagram of the body projected on the face) could find the root cause of the pain and deduce that it may be a structural problem. Dien Chan does not make physical adjustments but does relax, reducing the pain of the affected area. Recommending to the client that a visit to an Osteopath or Chiropractor, would be appropriate. Visit our websites and get more pointers to treat yourself and avoid taking too many pills! Web site dedicated to multireflexology treatments using BQC·points on the face. The new æsthetic therapeutic technique developed by the research team of EiMDC. Learn, get pointers and purchase multireflex tools. A complete protocol to treat muscular pain. Get a free sample of the Dien Chan - Multireflexology iBook.